This story starts the week before the opening day of bow season when the first weather forecast was released for that Wednesday; high temperature approaching 80 degrees with a low around 60. Not a good start to the season. Between Friday and Tuesday evening, there probably wasn’t a person in my circle that I didn’t grumble at about the warm weather and how it would negatively affect deer movement. Opening day rolled around and, of course, it is always easy getting out of bed that first day. The excitement and adrenalin is flowing freely through your body. You don’t recall if you even fell asleep that night but for a few minutes. Warm weather or not, deer activity or not, opening day, tree stand, count me there. I was nestled in my stand a good hour before first light. The sun rose on a new season….and seemed to set just as quickly. I saw a grand total of 0 deer for the day. What I did see however, was about 9 different pieces of farm equipment and an equal number of people who decided to cultivate the field my stand sits on that day! I hung tough for the entire day hoping that maybe a deer would get curious and come see who was stealing all their food. No such luck. The second day of the season is always a bit harder on the body when your alarm goes off. This morning, knowing that I saw 0 deer, the weather again was supposed to be near 80, and my main, most favorite stand location was an epicenter for human activity, made it especially hard. A fleeting thought to shut off the alarm and go back to sleep went through the back of my brain. Don’t taint your core hunting area this early in the season when the deer just aren’t moving during shooting light. Lay low and give it a couple more weeks for the temps to drop and the deer activity to increase I thought. Despite my logical brain telling me one thing, my die-hard hunter instincts were telling me the opposite; get in the woods every second you possibly can hunt during the season. Day #2, here I come. As I headed out that morning to my main stand location, I somehow forgot about the mass of commotion in the field by it until I started walking. I have an alternate stand location that I use later in the season that is closer to the doe bedding areas. I typically don’t like “tainting” that location this early, but it was either that, or probably watch tractors and people again for most the day. It was a very last minute decision that morning, but I made my mind up to pop into that alternate stand location at least for the morning. It was a much cooler morning than what I had expected. A very damp, heavy, foggy air lingered over the woods. A weird and rare NE wind direction made my stand almost perfect to hunt that morning (and totally unplanned that way). I was again in my stand an hour before light with a very light fall breeze in my face. The sun dawned on a new day just before 7am. Not overly optimist on this morning knowing I am hunting my secondary location. By 7:30 my mind is wandering back to the previous day’s festivities and the lack of deer movement during daylight. Not a minute later, I for whatever reason (because he made no sound), turned around to look behind me, straight down wind, where the deer are NOT supposed to come from. There he stood. He managed to walk behind me like a ghost and was no less than 10’ from walking out of sight, never to be seen by me, or maybe anybody, again. As much preparation as I take before entering the woods with scent elimination, I thought for sure he was going to bust me before I could get a shot. I take great pride in being selective at what I shoot at. I will spend as much time as possible reviewing the deer to see if he is mature and what size rack he has before making the fateful decision to shoot. This deer provided me no such opportunity. I could tell immediately that he was a huge bodied deer and that his rack was very tall (he was walking from my left to my right so I could see the height of the right side of his rack). Thankfully he decided to stop for a brief couple seconds to look around, which is the only reason I was able to view him at all. As I always do, I rangefind the trees in the area to be able to quickly field judge shooting distance in the event that I don’t have the time to get a rangefinder on the animal. Preparation came to fruition this damp morning. Just in front of my 40 yard tree. The one benefit of him coming in behind me, I could use the tree to camouflage my movement to get into shooting position. I grabbed my bow off the hanger, did a 180 in my tree stand and slowly leaned around the side of the tree to get in shooting position. Of course, of all the branches I cut and shooting lanes I cleared, it is always the one you didn’t that is the issue. There was a branch off a small sapling behind my tree that was literally 3 feet in front of the tip of my broadhead. It couldn’t have been placed any more perfect between my arrow and his vitals. Up on my toes now, leaning to my right around the back of the tree, not exactly a shot you practice! And, why not, the deer stopped directly behind another sapling! I had a window of about 5 feet once he left his current spot, until he was gone. I waited patiently, bow drawn, trying to be as steady as possible in an awkward shooting position for him to step forward. What seemed like forever was, in reality, a matter of just a few seconds. He took a step, I let out a humanized grunt call, he stopped in my only window of opportunity, I put my pin right in his vitals and I let the arrow fly; that unmistakable “thunk” of an arrow hitting its target. He spun around, took a few giant leaps about 30 feet and crashed hard to the ground. Maybe for the first time in what felt like 5 minutes, I took a breath. The adrenaline rushed through my body and I shook like a leaf as my brain tried to comprehend the events that unfolded before me. I could see him down in the thick brush with my binoculars. I still had no idea how big he was. Thoughts start going through your head: Is he just an 8? Did he even have a left side? Was he as big as I thought? Questions, questions, questions. Being able to see him down, I knew he had expired, so it was only a matter of about 30 minutes I waited before going to see him. I walked over to where he was hit. It was a complete pass-through. My Bear Anarchy Bow and Grim Reaper broadhead executed the plan perfectly. Not that I needed to follow a blood trail knowing where he was, but it was glaring obvious what direction he went. There is a very real thing called ground shrinkage that most hunters have experienced. A deer always has this uncanny ability to look much bigger on the hoof then after you shoot him. That was the lingering thought as I drew closer to where he lay. This was a very rare occasion where a deer had the opposite effect. As I approached him, I was utterly astounded at how big he truly was. Had I had even a few seconds to watch and judge him, I may have been shaking like a leaf trying to shoot. It worked out perfectly that instincts took over and my brain never had the chance to comprehend his size. 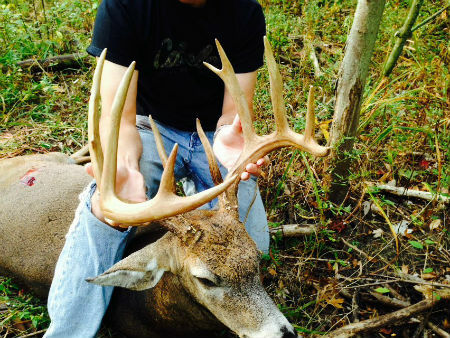 He is almost a perfectly symmetrical, main-frame 10 pointer with a gross score of 152 ½”. He has split G2’s that would make him a scoreable “non-typical” 12 also. He is too beautiful of a 10 to have him listed as anything else. Perhaps the most glaring feature on this buck that makes him so unique is his height. 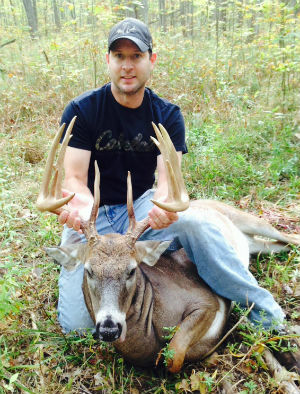 His brow tines average 8”. His G2’s average 10.5”. His G3’s average 9.5”. All around, a world-class whitetail taken right here in the great state of New York. The story ends with a final thought: You have to be in the woods, despite the weather, the people, the moon phase, etc., etc. to shoot a deer. Simple as that!